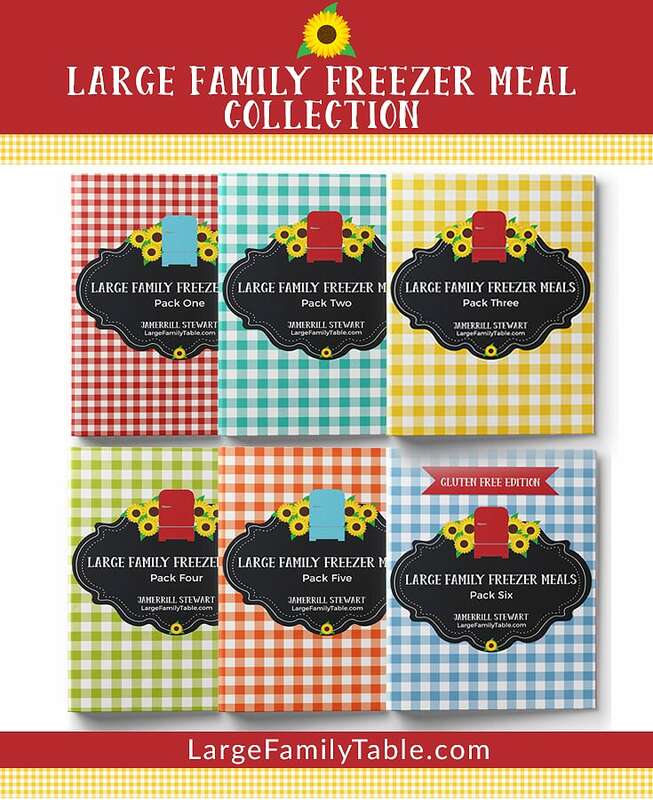 Click here to watch the full video of our Large Family Freezer Cooking Day! Fully reminded daily that I’m not super mom, 🙂 I have yet to pull off another full freezer meals for the slow cooker attempt like I was able to do for February. Most of those meals turned out wonderful and I still have a few left for needed days. I hope to be able to carve out another slow cooker meals day in the not-too-distant future. We currently have lots of family preparations and buzzing around in the works since I’m speaking at the Teach Them Diligently Convention in Nashville this week. Then I speak again in 2 weeks in Atlanta. Needless to say, it’s a busy time and it would be nice to have some handy PB&Js, burritos, and muffins available. So last week the kids and I took about 4 hours one afternoon to whip up these quick, no-brainer freezer cooking snack-type items. A quick shot of our freezer cooking day table! The muffins are a total cheat, recipe-wise. They are all pre-made packets that I found marked down for 3/$1 on our Large Family Grocery Shopping Day. Here is how I made the Peanut Butter and Jellys for the freezer (these defrost perfectly and are not soggy). For the burritos, I didn’t use anyone’s recipe in particular. I cooked up 4 lbs. of ground beef seasoned with chili powder, onion powder, and garlic powder. Then I mixed in 2-32 oz. cans of refried beans. You can see in the video we added a handful of cheese to each burrito. My poor son, Jadin, shredded 6 lbs. of cheese and we didn’t come anywhere close to using it all. It did come in handy to top our chili with later in the week. Click here to watch our full Large Family Freezer Cooking event with 75 PB&Js, 60 burritos, and 84 muffins! I am bummed I cannot get the free meal planner to work! it accepted my email but I have not received it yet! The link to the PBJ does not work. Can you post or link me to the right one? I cannot get the free meal planner to work! it accepted my email but I have not received it yet!